Hearing Loss | S.E. Wisconsin Hearing Center Inc.
talking at the same time? Do people complain that you turn the TV volume up to high? Do people get annoyed because you misunderstand them? If you answered yes to three or more you may have a hearing problem. Includes the pinna and ear canal. 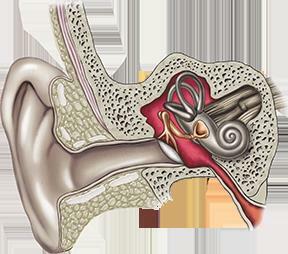 The outer ear funnels sound to the eardrum and deeper structures in the ear. The shape of the outer ear also amplifies the softer high-frequency sounds of speech. 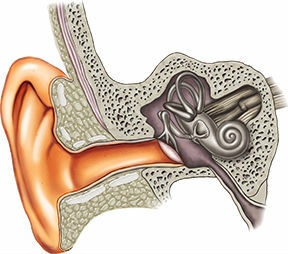 The eardrum separates the outer ear from the middle ear. 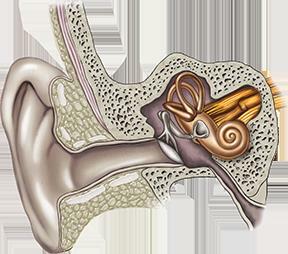 After sound has been funneled through the ear canal, the force of that sound causes the eardrum to vibrate. Contains a chain of three very small bones that are attached to the eardrum. These bones, called the malleus, incus, and stapes, pick up the tiny vibrations of the eardrum. These three bones act like a series of levers to make the vibrations of the eardrum more intense. Includes the organs of hearing and balance. The part of the inner ear devoted to the hearing process is the cochlea (pronounced COKE-lee-uh). When sound vibrations reach the cochlea, microscopic fibrous cells called hair cells change sound from one form of energy to another. Hair cells in the cochlea change sound from a vibratory movement into electrical signals that are then sent up to the brain. After the cochlea has converted sound into an electrical signal, that signal is sent up the auditory nerve to the brain where all understanding of speech occurs. Most patients with sensorineural hearing loss have damage to these hair cells, meaning that soft sounds never get efficiently converted to a form of energy that the brain can understand. What if I’m a Baby boomer? We are not our parents. We see ourselves as 30 years old with 20 years’ experience and we are extremely active. Here is some interesting facts on baby boomers. We’re going back to school to get graduate and professional degrees. Hearing connects us to a particular place and time. It connects us to the now. Good hearing gives us more access to opportunities in life as well as precious moments in life. It empowers us to be all that we can and want to be. Hearing and keeping your hearing at its best is a way of redefining tomorrow. Hearing enhanced by hearing technology gives people the power to write their own future. Finally, hearing is relevant to staying healthy, traveling and eating out, staying effective at work, increased earnings, connecting with others and caring for loved ones. What degree is affecting my life? Do you hear people but don’t understand what they are saying? Do you struggle in noisy environments? Do you have ringing in your ears? Do you hardly hear at all? A person who hears but does not understand may have a mild loss in the lower frequencies but a moderate to severe loss in the higher frequencies. However, a person who does not hear nor understand most likely has a loss in both the low and high frequencies. If background noise is a problem you might need a hearing device with better noise management capabilities. A comprehensive test of tones and speech will determine what hearing device is recommended to address your hearing loss and lifestyle needs. If you are an active person and find yourself in social situations, you may need higher end technology to optimize the benefits. On the other hand if you are more sedentary and are most often engaged in quiet conversation, watching TV, and having a telephone conversation, a basic hearing device may be all that you need. You should buy from a hearing health care provider that you feel comfortable with. You want to have a professional that takes time to discuss your hearing concerns thoroughly and gives you the time that you deserve. Hearing loss is very serious as it not only affects you, but also affects your family and those close to you. What’s included with the purchase of my hearing devices? We are truly independent hearing healthcare professionals. As an independent business owner, you the patient are my concern. When you come to S.E. Wisconsin Hearing Center you will be fitted with the best hearing aid for your hearing needs, and not a hearing aid brand that the manufacturer has limited me to. You can choose from multiple brands including: Siemens, Oticon, Starkey, Phonak, ReSound, Unitron, Widex, and Sonic. We only fit our patients with state of the art digital technology. Here is the best part: You can test drive all the major brands to see which one is best for you. There are three main reasons people request a hearing test. They know they have a problem, they think they might have a problem or someone else thinks they have a problem. Whatever the case, it is always a good idea to have your hearing tested. Not only does it give your hearing healthcare provider a starting base line but if you have a hearing loss it is best to treat it now rather than later. 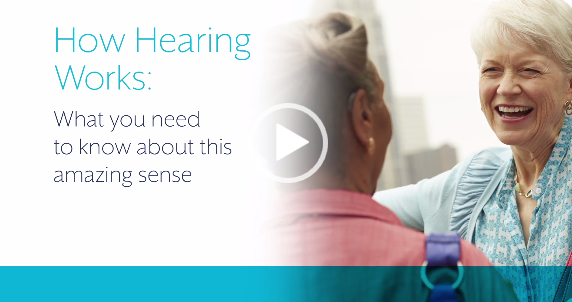 Untreated hearing loss has many serious consequences. Untreated hearing loss has now been linked to isolation, depression, falling, stress, fatigue and cognitive decline. They have also found in autopsies that people with untreated hearing loss have more brain atrophy than those with normal hearing or have treated their hearing loss. Treating hearing loss early results in a more productive life, better relationships, higher salaries, and more enjoyment out of life. They are not your grandmother’s hearing aids. Today’s hearing aids are miniature computers that communicate wirelessly with each other making millions of calculations per second to automatically change to the environment that you are in. They enhance speech, suppress background noise, and have built in therapy for tinnitus (ringing in the ears). They are virtually invisible and can be connected to your phone and TV. There are many choices today. With the influx of the baby boomers many businesses want to tap into the market. Retail stores, pharmacies and even insurance companies are looking to get into the market with their own private technology. There are the traditional franchise chains as well as Independent Hearing Healthcare professionals in private practice. There are major differences between choosing an independent private practice, retail store, franchise, pharmacy or and insurance company. You want your hearing health care provider to take the time needed to fully test you. You also want to have all of your questions answered. Finally, you should be giving the opportunity to test drive the hearing device that is recommended for you to experience how it works in your own environments. We are a truly independent hearing healthcare professional. As an independent business owner, you the patient are my concern. When you come to S. E. Wisconsin Hearing Center you will be fit with the best hearing aid for your hearing needs and not a hearing aid brand that the manufacturer has limited me to. We carry every major brand including: Oticon, Siemens, Starkey, Phonak, Unitron, ReSound, Widex and Sonic. We only fit our patients with state of the art digital technology. We always do a comprehensive hearing test of pure tones, bone conduction and speech.